History was made at the Fast and the Furious-2014 Show when supercars competed against military jets, thrilling a large audience. Last weekend, the Ramenskoye Airport in Zhukovsky, near Moscow, witnessed a spectacular event- event – the Fast and the Furious-2014 Show. Fighting for first place were Ferrari, Mitsubishi, Bugatti, Lamborghini and Aston Martin cars, along with MiG-29 and Su-30 aircrafts. Even the rain could not drown out the roar of the engines or dampen the enthusiasm of the audience. The stands were crowded, and the bad weather only added intensity to the competition. It was not means a blow out for the planes, but the final victory went to the MiG-29 fighter. Among the cars, coming closest to victory was the Mitsubishi Lancer Evolution VIII ARS, driven by Krasnodar driver Dmitry Pleshakov, one of the best race drivers in Russia and Eastern Europe. Pleshakov admitted that despite his long distinguished career in motorsports, the format of this event is extremely engaging. “It seems everything is suddenly over, and I still cannot grasp that I, a race car driver, was competing against a fighter jet,” he commented. As part of the festivities, an AutoExotic Car Show was held. 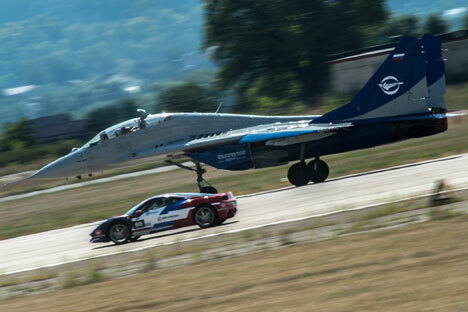 The display of unusual cars used to be an independent event that was held on the territory of Tushino Airfield. This year, the show was shifted to the Ramenskoye Airport. This colourful show attracted the attention of all visitors. The one thing that each care in this multitude had in common was uniqueness. The Fast and the Furious-2014 Show opened a new page in the history of car and aero events. Ramenskoye will be long remembered by show participants and visitors for the roar of the engines, power, speed, applause and cheers that filled the airfield during the event.